Life at Stamping Details: Carol Murphy At Stamping Details! What a weekend this is going to be! Carol Murphy is HERE to teach on Saturday!!! Take a moment to see Carol's beautiful work HERE on her website: http://www.alteredbydesign.com/homepage.html. We are honored to have two of her classes here on Saturday and there are just a few spots left. 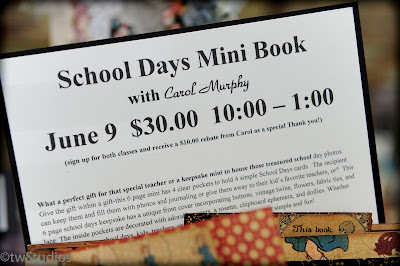 First Class is Saturday from 10 AM to 1 PM called "School Days Mini Book"
What a perfect gift for that special teacher or a keepsake mini to house those treasured school day photos. Give the gift within a gift – this six page mini has four clear pockets to hold four simple School Days cards. The recipient can keep them and fill them with photos and journaling or give them away to their kid's favorite teachers, or? This school days keepsake has a unique front cover incorporating buttons, adorable images, chipboard images,vintage twine, flowers, fabric ties, and lace. 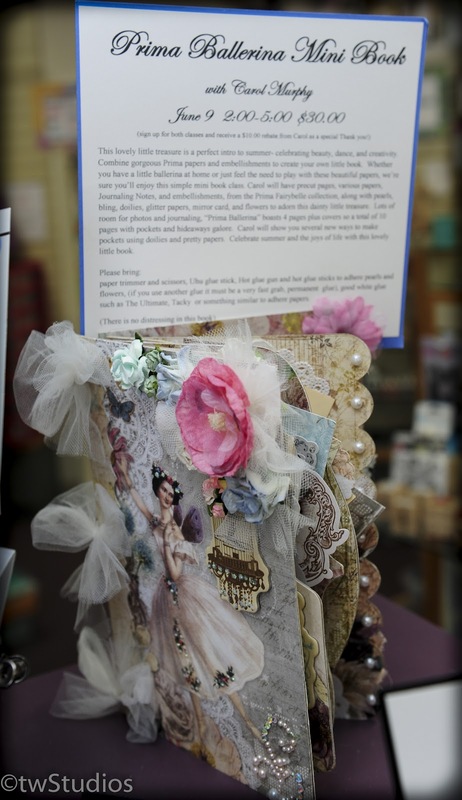 The inside pockets are decorated with adorable papers, a rosette, chipboard ephemera, and doilies. Whether you're celebrating school days, kids, teachers, or fond memories this class is super simple and fun! Please bring to class: paper trimmer and scissors, Uhu glue stick, good white glue such as The Ultimate, Super Tacky or something similar to adhere paper pockets, if you have a distress tool please bring it, Vintage Photo or your fave Distress pad for the pages only, ¼ or ½ inch double sided tape or something similar. 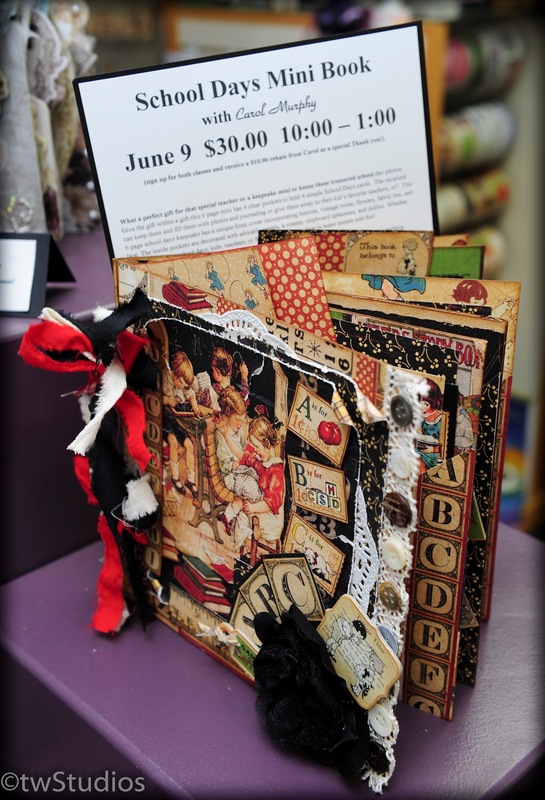 Second Class is also Saturday from 2 PM to 5 PM called "Prima Ballerina Book"
This lovely little treasure is a perfect intro to summer – celebrating beauty, dance, and creativity. 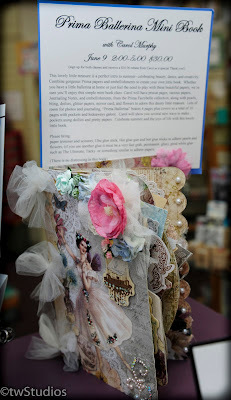 Combine gorgeous Prima papers and embellishments to create your own little book. Whether you have a little ballerina at home or just feel the need to play with these beautiful papers, we're sure you'll enjoy this simple mini book class. Carol will have pre-cut pages, various papers, Journaling Notes, and embellishments, from the Prima Fairybelle collection, along with pearls, bling, doilies, glitter papers, mirror card, and flowers to adorn this dainty little treasure. Lots of room for photos and journaling, "Prima Ballerina" boasts four pages plus covers so a total of ten pages with pockets and hideaways galore. Carol will show you several new ways to make pockets using doilies and pretty papers. Celebrate summer and the joys of life with this lovely little book. SAVINGS - If you sign up for both classes you receive a $10.00 rebate from Carol as a special "thank you" after taking both classes!" And you won't need to mail in a UPC to get your rebate!